Mary Frances Penick (December 30, 1931 – September 19, 2004), better known as Skeeter Davis, was an American country music singer who sang crossover pop music songs including 1962's "The End of the World". She started out as part of the Davis Sisters as a teenager in the late 1940s, eventually landing on RCA Victor. In the late 1950s, she became a solo star. One of the first women to achieve major stardom in the country music field as a solo vocalist, she was an acknowledged influence on Tammy Wynette and Dolly Parton and was hailed as an "extraordinary country/pop singer" by The New York Times music critic Robert Palmer. Davis was the first of seven children born to William Lee and Sarah Rachel Roberts Penick, in Dry Ridge, Kentucky. Because her grandfather thought that she had a lot of energy for a young child, he nicknamed Mary Frances "Skeeter" (slang for mosquito). The Penick family moved to Erlanger, Kentucky in 1947, where Skeeter met Betty Jack Davis at Dixie Heights High School, becoming instant friends. They sang together through much of high school, and at Decoursey Baptist Church. They formed the duet known as the Davis Sisters (although they were unrelated), and started singing on Detroit radio station WJR's program Barnyard Frolics. Eventually, the duo were signed by RCA Victor in 1951. Earlier demo recordings were eventually released on Fortune Records. RCA Victor producer Steve Sholes liked the Davis Sisters' harmonies and offered the duo a recording contract in 1953. Their most successful release was "I Forgot More Than You'll Ever Know", which spent eight weeks at No. 1 on the country charts in 1953, as well as making the Top 20 on the pop charts. The record ranks No. 65 on the Top 100 Country Singles of All Time, according to Billboard historian Joel Whitburn. While "I Forgot More Than You'll Ever Know" was climbing the charts, the Davis Sisters were involved in a major car accident on August 1, 1953. The crash killed Betty Jack Davis and left Skeeter with severe injuries. After the accident, Skeeter and Betty Jack's sister, Georgia, continued as the Davis Sisters. Skeeter decided to retire from the music industry in 1956, and get married, ending the duet. Davis decided to go back into country music as a solo act in 1958. She began touring with Ernest Tubb and she returned to RCA Victor, this time working with guitarist and record producer Chet Atkins. That year, Davis recorded "Lost to a Geisha Girl", an answer song to Hank Locklin's hit "Geisha Girl", which reached the country Top 15 and became her first solo hit. Atkins worked with Davis as a guitarist on all of these sessions. At Davis' suggestion, Atkins frequently multi-tracked Davis' voice for harmony vocals to resemble the sound of the Davis Sisters. This echo can be found on several of her early solo hits, such as "Am I That Easy to Forget". Davis had a Top 5 country hit, "Set Him Free", in 1959, as well as another Top 20 hit called "Homebreaker". She also joined the Grand Ole Opry that year, and was nominated for a Grammy Award for "Set Him Free", becoming the first female country singer to be nominated for a Grammy. From 1960 to 1962, Davis had top ten hits with the songs "(I Can't Help You) I'm Falling Too", "My Last Date (With You)", "Where I Ought to Be" and "Optimistic". "(I Can't Help You) I'm Falling Too" in 1960 was her first entrance as a solo onto the pop charts. The song went all the way to the Top 40, unheard of for a female country singer at the time. In 1961, she scored a second pop hit with a lyric version (written by Skeeter) of Floyd Cramer's instrumental country pop smash "Last Date" called "My Last Date (With You)" which did even better making the Top 30 on the pop charts. Both of these songs did exceptionally well on the country charts, peaking at No. 2 and No. 5, respectively.Silver thread and Golden needles. In 1963, Davis achieved her biggest success with country pop crossover hit "The End of the World". The song just missed topping the country and pop charts that year; however, it did top the adult contemporary charts. The record was also a surprise top five hit on the rhythm and blues charts, making Davis one of the very few Caucasian female singers to have a top ten hit in that market. The single sold over one million copies, and was awarded a gold disc. "The End of the World" soon became Davis' signature song. Davis achieved one other country-pop hit with the Gerry Goffin and Carole King-penned "I Can't Stay Mad at You", which peaked at No. 7 on the pop charts and No. 2 on the Easy Listening chart in 1963. She made several appearances on the pop music show American Bandstand in the early 1960s and a decade later was one of the first country artists to appear on The Midnight Special. Another big 1963 hit was I'm Saving My Love, written by Alex Zanetis. Davis' success continued with "I'm Saving My Love" and 1964's Gonna Get Along Without You Now, an updated cover a 1956 hit by Patience and Prudence). Both made the Top 10 on the country charts and cracked the Billboard Top 50 pop charts, though the success of "Gonna Get" was likely hampered by another remake of the song by vocalist Tracey Dey simultaneously climbing the charts to peak slightly lower than Davis' version. Later pop efforts, like "Let Me Get Close to You" in July 1964, missed making the Billboard Hot 100, reflecting the changing nature of pop styles due to the ongoing British Invasion but Davis continued a successful run on the country charts. In 1965, she recorded a duet with Bobby Bare called "A Dear John Letter", which just missed the country Top 10 and received light pop action. (The best-known version of the song had been recorded originally by Jean Shepard and Ferlin Husky in 1953.) Davis also recorded quite a few albums during this time, including two tribute albums I Love Flatt and Scruggs and Skeeter Davis Sings Buddy Holly. In 1967, Davis was back in the top ten with "What Does It Take (To Keep a Man Like You Satisfied)". Davis only achieved two other major country hits the rest of the decade, "Fuel to the Flame" (written by Dolly Parton, whom Davis paid tribute to with an album called Skeeter Sings Dolly in 1972), and "There's a Fool Born Every Minute". Other singles were minor hits, but she released many albums. In 1970, Davis had another Top 10 hit with "I'm a Lover (Not a Fighter)" and another duet with Bobby Bare with "Your Husband, My Wife". The following year, she had a hit with the autobiographical "Bus Fare To Kentucky". Subsequently, however, her chart success began to fade. Singles such as "It's Hard to Be a Woman" and "Love Takes a Lot of My Time" failed to crack the country Top 40. "One Tin Soldier" did not get much attention from country radio but was nominated for a Grammy as Best Female Country Vocal. The record was a major success in Canada, however, peaking at No. 2 on their easy listening chart and No. 4 country. In the 1970s, she began regularly touring foreign countries such as Barbados, Singapore, and Sweden, where she was among the most popular entertainers of any field. In 1973, she had a brief comeback with her Top 20 hit, "I Can't Believe That It's All Over". During a performance at the Grand Ole Opry in 1973, Davis criticized Nashville police for arresting a group of evangelists at a local mall, and was suspended from the Opry. She was reinstated at the Opry more than a year later. Despite losing several bookings during that period, Davis remained active by singing with a number of religious ministries and spent an extensive period evangelizing in Africa. Davis returned to the recording studio in 1976 with a brief stint on Mercury Records which produced two single releases, including her last song to make the national charts, 1976's "I Love Us". In 1978, she recorded the first of several albums for minor record labels which she would do on occasion into the 1990s. Davis was married three times. Her first husband was Kenneth Depew. In 1960 she married WSM disc jockey Ralph Emery, divorcing in 1964. In 1987 she married NRBQ's bassist Joey Spampinato with whom she had recorded the album She Sings, They Play; they divorced in 1996. Davis lived in Brentwood, Tennessee, from the early 1960s until the time of her death in 2004. Her autobiography, Bus Fare to Kentucky (named after a 1971 song), was published in 1993. In 1998, she wrote a children's book, The Christmas Note, with Cathie Pelletier. In 2001, she became incapacitated by breast cancer. Davis remained a member of the Grand Ole Opry until her death, making her last appearance there in 2002. She died of breast cancer in a Nashville, Tennessee, hospice at the age of 72, on September 19, 2004. ↑ Palmer, Robert (1985-12-15). "Critics' Choice; Pop Music". The New York Times. Retrieved 2009-08-05. ↑ Whitburn, Joel (2006). The Billboard Book of Top 40 Country Hits (2 ed.). Billboard Books. p. 101. ISBN 0-8230-8291-1. ↑ Feldman, Christopher (2000). The Billboard Book of No 2 Singles. Watson-Guptill. p. 66. ISBN 0-8230-7695-4. ↑ Erlewine, Michael (1997). All Music Guide to Country: The Experts' Guide to the Best Recordings In Country Mmusic (3 ed.). Hal Leonard Corporation. p. 116. ISBN 0-87930-475-8. 1 2 Gilliland, John (1969). "Show 10 - Tennessee Firebird: American country music before and after Elvis. [Part 2]" (audio). Pop Chronicles. Digital.library.unt.edu. ↑ Murrells, Joseph (1978). The Book of Golden Discs (2nd ed.). London: Barrie and Jenkins Ltd. p. 145. ISBN 0-214-20512-6. ↑ Whitburn, Joel (2002). Top Adult Contemporary: 1961-2001. Record Research. p. 73. 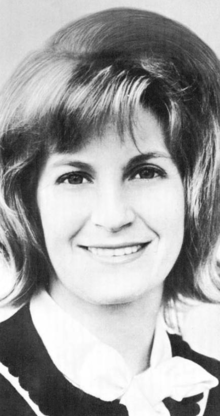 ↑ "CMT News: Grand Ole Opry's Skeeter Davis Dead at 72". cmt.com. 2004-09-19. Retrieved 2012-12-24. ↑ Wolfe, Charles K. (1996). Kentucky Country: Folk and Country Music of Kentucky. University Press of Kentucky. p. 144. ISBN 0-813-10879-9. ↑ Kingsbury, Paul, ed. (2004). The Encyclopedia of Country Music:The Ultimate Guide to the Music: The Ultimate Guide to the Music. Oxford University Press. p. 138. ISBN 0-195-17608-1. ↑ "Skeeter Davis: Country diva who sang 'The End of the World'". independent.co.uk. 2004-09-22. Retrieved 2009-08-05. "(I Can't Help You) I'm Falling Too"
"Gonna Get Along Without Ya Now"
"The Hands You're Holding Now"
"He Says the Same Things to Me"
"I Can't Believe That It's All Over"
"I Can't Stay Mad at You"
"I'm a Lover (Not a Fighter)"
"Lost to a Geisha Girl"
"My Last Date (with You)"
"Please Help Me, I'm Falling"
"There's a Fool Born Every Minute"
"What Does It Take (To Keep a Man Like You Satisfied)"
"Where I Ought to Be"